Zionist Union sources say divide between Yisrael Beytenu and Joint Arab List may be too deep for opposition to make any real traction. Even the narrowest of coalitions won't ensure that the disparate parties of the opposition will be able to work together, a senior Zionist Union official asserted Sunday. This disunity, the official suggested, could help strengthen Prime Minister Binyamin Netanyahu's latest government. Haaretz reported Sunday that Zionist Union members believed the narrow gap between coalition members to opposition members (61 to 59) would only play a factor in major policy votes. 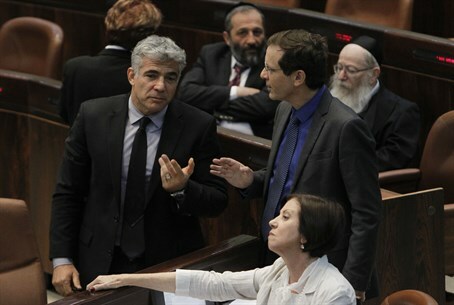 “In the less dramatic votes, the coalition will buy quite a few MKs by promising that they will advance legislation or projects for them if they disappear from the Knesset session at the right moment,” they said. In related news, Zionist Union is scheduled to vote this week for its faction chairman - the MK who coordinates the opposition's struggles against the government and also wades through the factions that make up the coalition. "The person appointed can decide the fate of the opposition for good or for bad," a party source told Haaretz.